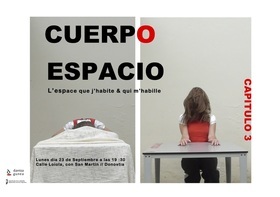 "Cuerpo Espacio - l'espace que j'habite et qui m'habille" is a street dance performance that invites people to observe the various signs, senses, emotions, codes or languages that may evoke moving bodies and spaces in a daily life, being that of the street, public-intimate space. The movements of the dancer Sofie Dubs highlight, or reveal the dances that are often created unwittingly in our cities' architecture, accompanied by guitarist Ebi Soria (San Sebastian) or accordionist Clara Colle (Chambery). This performance questions the social body and the intimate body, if they might be even separated! ?